Today the head of the Legislative Chamber was finally elected. After endless discussions, 38 year-old Vasili Oiun, ex-Vice-Prime Minister of the Tuvan government, received 18 out of 22 votes from his colleagues after nine previous attempts. With this election, a two-month crisis in the Republic is now over. A celebration for the International Day for Speech and Hearing-Impaired People was held in a Kyzyl school for children. The celebration consisted of dances and songs performed in gesture. There are 513 speech and hearing-impaired people in Tuva, and of those, 121 children live and study in this specialized school. Tuvan sportsman Ayan-ool Ondar has been awarded the grade of Master of the International class in wrestling-which is an all-Russian recognition of his sports merits. The promising young wrestler formerly performed for a Tuvan team but is now representing the Krasnoyarsk territory. Representatives of the Tuvan Union of Artists, Alexandr Oidup, Alla Kudoyarova, and Kheimer-ool Dongak, have just come back from the first sitting of the organizing committee of the all-Siberian exhibition, ЂSibirЂ, which will take place next August in Irkutsk. The first scientific conference on 'Balneo Resources of Tuva and Prospects of Their Exploitations' in the Republic has just ended in Kyzyl. The reports presented shed light on both the state of, and possible future exploitation of lakes, which Tuva is rich with. One of the lakes, Cheder, a very famous resort, has already been studied by the scientists, and is found to be good for treating intestinal problems. Among the Tuvan water springs, one of the most famous is Shivilig, located in Bai-Taiga, a western district of Tuva. A new cd of Tuvan folk music is under preparation. 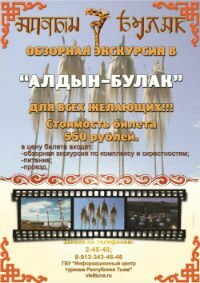 The album, prepared by the Scientific Center ЂKhoomeiЂ, will contain unique recordings of the master throat-singers of Tuva, most of who are no longer alive. Some of the artists featured are, Marzhymal Ondar, Oorzhak Khunashtar-ool, Soruktu Kyrgys, Oleg Kuular, Gennady Tumat, Gennady Chash, and Andrei Chuldum-ool. Today the lottery for the free space in the municipal newspapers among the candidates for the post of mayor of Kyzyl took place. The contenders for the position, who officially registered are, philosopher Vladimir Bagai-ool, Deputy Chairman of the Tuvan Government Victor Vusaty, Deputy Chairman of the Tuvan Government Dmitiri Dongak, Deputy Chief of the School Department Zinaida Dechtyar, City Council deputy Ostap Damba-Khuurak, chief of the house maitenance unit 'Our House' Oxana Kenden, businessman Eduard Naxyl, a businessman from the neighboring city of Sayanogorsk Vitaly Popov, director of a construction firm Sergei Safrin, scientific astronomer Alexei Tevek, director of a machine plant Vladimir Serikov, director of the Alcohol Quality Control Center Orlan Tinmei, and Minister of Justice of Tuva Alexandr Yazev. Seven hundred and fifty six Tuvan children have not begun their academic year on the first of September due to the lack of proper clothing and shoes. In the villiage of Kaa-Khem, which is very close to Kyzyl, takes on the first wave of migrants from far-off districts (who are on the way to move to the capital) of Tuva, a campaign for gathering began and still goes on. The local alexistration sent letters to local businessmen asking to help the children to be able to go to school. Today is the 90th birthday of the legendary Maxim Munzuk, a Tuvan actor, writer, director, and folklore collector who made Tuva known after his triumphant role of Dersou Usala in the film of the same title made by Japanese director Akira Kurosawa.